German Chancellor Angela Merkel, a top candidate of the Christian Democratic Union Party (CDU) for the upcoming general elections, speaks during an election rally in Binz, Germany, September 16, 2017. BERLIN - Germany will have no choice but to restrict its economic ties with Turkey to pressure its NATO partner into releasing German citizens it imprisoned on political grounds, Chancellor Angela Merkel said in remarks published on Saturday. Relations between the two countries are strained by Turkish President Tayyip Erdogan’s crackdown on opponents after a failed coup last year. Germany and its partners in the European Union say the crackdown undermines democracy. Turkey and Germany are also at odds over Berlin’s refusal to extradite asylum seekers Erdogan accuses of involvement in the botched coup against him. “We will have to further cut back our joint economic cooperation with Turkey and scrutinize projects,” Merkel told the Passauer Neuen Presse newspaper in an interview when asked how she wants to secure the release of Germans held in Turkey. The simmering tensions have seeped into campaigning for a federal election in Germany, especially after Erdogan urged German Turks to boycott the main parties in the vote on Sept. 24. German officials have been enraged by Turkey’s arrest of around a dozen German citizens, including the German-Turkish journalist Deniz Yucel, who has been held for more than 200 days. Merkel, whose conservatives are expected to win the election and secure her a fourth term in office, said on Tuesday Germany would restrict some arms sales to Turkey. Foreign Minister Sigmar Gabriel of the center-left Social Democrats (SPD) who are trailing the conservatives in opinion polls, had earlier said that all major arms exports to Turkey had been put on hold. 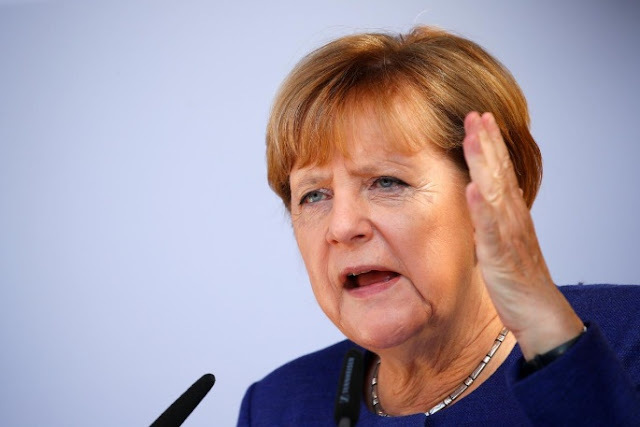 Merkel said during a televised debate earlier this month that Turkey should not become a member of the European Union - Turkey’s largest trading partner with which it has a customs union. She said she would talk to Germany’s EU partners to reach a compromise on ending Turkey’s accession talks with the bloc.